As we have traveled on this journey with Fletcher several people have asked me questions about his future. 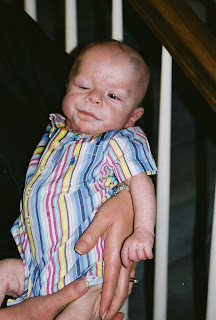 On the day Fletcher was born we knew something was wrong with his skin and on that day I remember crying to my pastor, Lance, and saying things like, what if people make fun of him? Kids can be so mean, what will I do if people are mean to him? Lance in all his wisdom sat quitely and let me talk and cry and talk and cry. He knew I just needed to work this out by talking it through. As you all know Fletcher's skin problems were the least of our worries! And as time went by and as he was hospitalized 9 times I wouldn't allow myself to think about Fletcher's tomorrows, I just couldn't bare to think about it. It was too painful. I just wanted him to make it through the day! My mantra became, 'be in today and trust him to Jesus' I can only imagine that I said that at least a thousand times. We've come a long way in two years. Fletcher is doing well and we are seeing subtle progress in our little trooper. I can honestly say that I still had not thought about Fletcher's future until this morning. I had the most wonderful dream last night. I dreamed that I was at The Center with Fletcher like I am everyday and when I walked into his unit he was sitting up in his crib. Then right in front of me he pulled his trach out! I was, of course mortified and scared and I was totally freaking out. But everyone around me was calm and the nurses were trying to calm me down. I called Craig and told him to come immediately, all the while everyone was trying to convince me that Fletcher might be ready for his trach to come out. 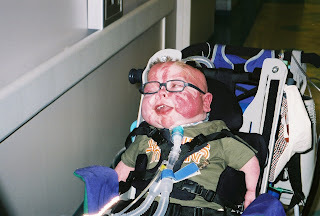 So, we watched him for a while and he was breathing on his very own and then the next thing I knew Fletcher wasn't hooked up to any machines, he was free of all tubes and wires. And then in my dream he took my hand and he began to walk. It was as if all that tubing and wiring were shackles holding him back and once he was free of them he just took off. It was so vivid, he was little and walking barefoot, holding my hand! It was truly amazing. As I've thought over this today I've been wondering if the Lord had given me a vision. So, I decided to get out my Bible and in the concordance I looked up the word dream. And it referenced the only verse in there the one about old men dreaming dreams. Well as I was trying to find the book of Joel I happened on Habakkuk 2:3 and this was underlined "Though it linger, wait for it; it will certainly come and will not delay." So, if it wasn't a vision, I'll take it as a promise from the One who loves me so much. I certainly will continue to wait, because the Lord's timing is perfect. And I want what is perfect for my sweet Fletcher. I've posted these pictures thinking of how much my sweet boy has changed and grown! Hope you enjoy them! what a wonderful dream! When I was working there and even now that I'm not there anymore, I've had several dreams like that about those kiddos....they are always so uplifting and positive. I fully believe that Fletcher will do all those things that all kids do: walking, talking, etc. He's just going to do them in his own time! What a wonderful dream and what a great testimony how God speaks to us. Cling to all that you have been given by God. Thank you for sharing such a wonderful vision with us. "Paula, thanks so much -- your sister is such an inspiration! I sometimes think "I don't know how she does it", but, then, I know God gives her the strength. And, that little Fletcher -- isn't he just the most amazing little boy you've ever seen!!! He looks like a doll in those glasses and it's so good to get these updates. Keep me posted and I'll keep praying."